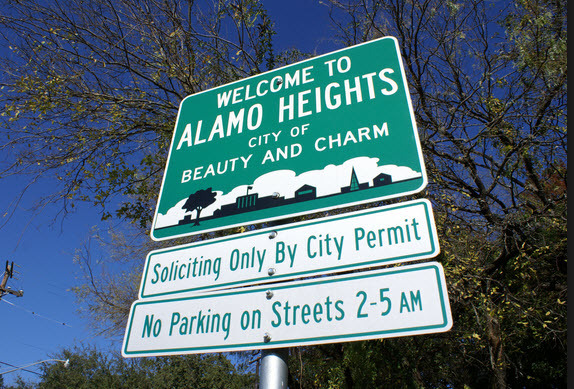 Alamo Heights, Texas consists of a unique, incorporated community in the midst of the City of San Antonio. Equally unique, the Alamo Heights TX real estate market showcases homes for sale in San Antonio unlike any others in the city. Lovely condos and townhomes, mix use features and single family homes align with an upscale flair and warm sense of welcome. Alamo Heights TX real estate is only 5 miles from San Antonio, yet far enough away to have a serene atmosphere. With an accent on upscale, gracious living, it defines itself primarily in residential amenities and minimal commercialization. For those interested, a wide variety of Alamo Heights homes for sale can be found amid this delightful enclave. Some homes for sale are located in areas near the compact town center, brimming with a beautiful blend of historic and modern features. Available homes are often also found in exclusive, secluded niches. Those interested in Alamo Heights homes for sale should expect to find a variety of property types, styles and floor plans. There is everything from historic and vintage to contemporary and modern options. Alamo Heights TX real estate has something to suit the fancy of every age group and family size. The community offers an enriching, friendly environment full of curb and price appeal. Homes for sale in Alamo Heights TX range in price from about $150,000 to over $2,000,000. Master-planned neighborhoods and amenities emphasize the appeal of Alamo Heights TX real estate, while the San Antonio River Valley sets a verdant and scenic stage for the community. Today, there are so many fun things to do in Alamo Heights. Residents can take advantage of The Alamo Quarry Market shopping center, Quarry Village, Lincoln Heights Shopping Center, and H-E-B’s Central Market for all their shopping and grocery needs. For retail stores, the North Star Mall has quality shopping. Other attractions include the San Antonio Zoo, Witte Museum, San Antonio Japanese Tea Garden, McNay Art Museum and the San Antonio Botanical Garden. Alamo Heights Independent School District serves the residents of Alamo Heights TX real estate. The public schools include Cambridge Elementary School, Woodridge Elementary School, Alamo Heights Junior School and Alamo Heights High School. There is also a selection of private schools including San Antonio Academy, St. Peter Prince of the Apostles Catholic School and St. Luke’s Episcopal among others. Along with a great education, there are also many community and city events that are great for families of all ages. Events such as Movie Nights in the Heights are great to watch movies outdoors on the big screen with friends and families. If you would like more information on Alamo Heights TX real estate, please contact the experts at McNabb and Co. at 512-667-9129. Find Alamo Heights Real Estate, Including Homes for Sale and Lifestyle Info.